Namibia, May - July 2013 - Namib-Naukluft B. Tsauchab River Camp and Naukluft Mountain Park. We enjoyed staying here as the campsites are well spread out in the bush and all are set under large shady wild fig trees. The camp owners, Johan and Nicky make you feel very welcome and the camp entrance and reception area is filled with 'iron art'. 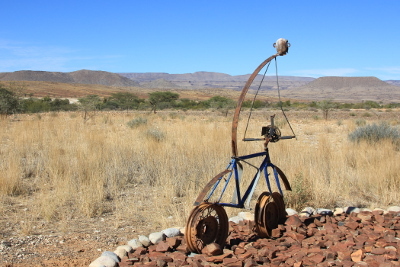 These are imaginative sculptures which Johan had created with old bits and pieces of iron. There are several well marked walking trails on the farm, you can get a map from reception and there are places to park at the start of the walks. 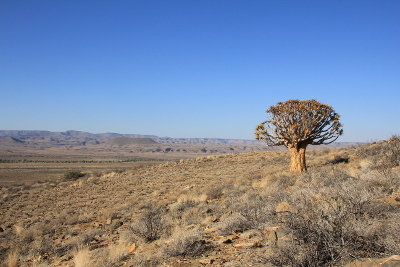 One morning we did the Quiver Tree Hike which gave good views of the surrounding land and the map also gave information about some of the trees and shrubs that you pass. Another day we walked up to the Namib Desert Viewpoint. 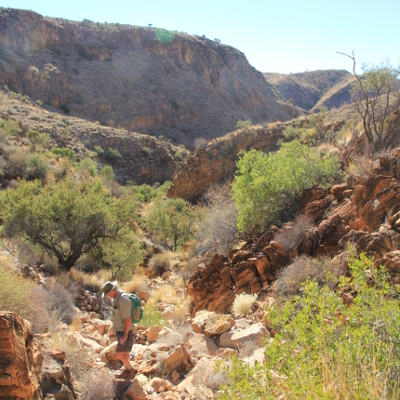 We saw springbok and mountain zebra on our walks. One of several quiver trees that we passed on the Quiver Tree Hike. 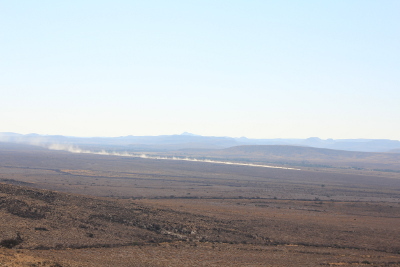 The dust trail of a small bakkie on the gravel road that passes the farm. 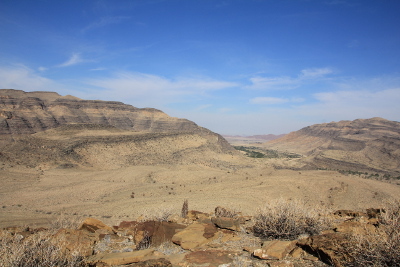 The view from the lookout point of the Namib Desert View walk. 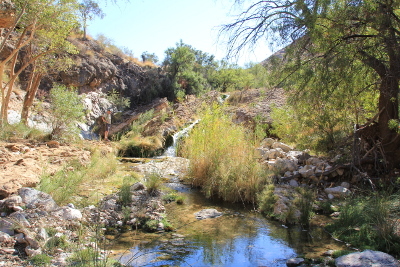 There are springs in the river valley on the farm. 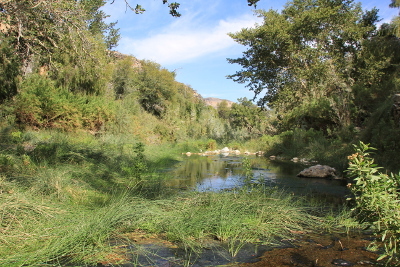 We'd visited this park for a day on our last visit to the area 3 years ago and it was definitely on our list for this trip but his time we camped in the Park on a small but well-shaded site close to the river, which did have water flowing along it. We did 2 walks in the Park, the Olive Trail and the first part of the Waterkloof Trail, you get a map from reception. The Olive Trail is 10km long and took us close to 4 hours, You walk up onto the plateau and then follow a gully which becomes a gorge back down to the car park. 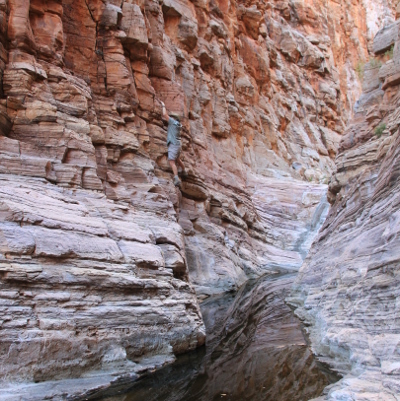 One section requires using a chain to get along the gorge above a pool so you do need a head for heights. We set off in the early morning so that we were walking uphill in the shade. we had wonderful views of the mountains to the south. 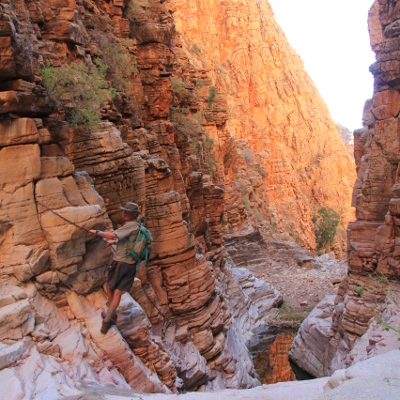 ..... which later became a steep sided gorge, dry when we were there. The narrow section with chains on either side to get along the gorge. Kevin at the start of the left hand chain. Michelle using the right hand chain to get along the gorge - it looks pretty impressive but actually wasn't hard. The Waterkloof Trail is a 17km circular walk but we just followed the river upstream for about 5 km and then returned by the same route. 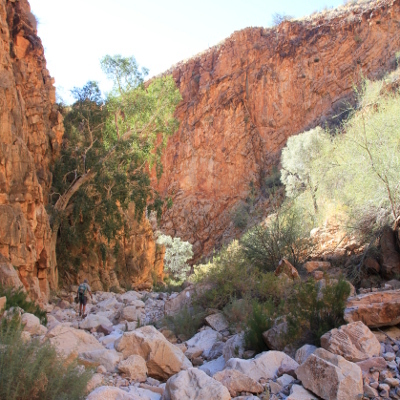 We had to cross the river on several occasions and there were some rocky sections where it was hard to see the correct route so we needed the route markers (yellow footprints) to see where to go. There was quite a lot of water in the river which made for an attractive walk. It was a lovely sunny winter's day with very little wind so we cooled down in the river on the way back. 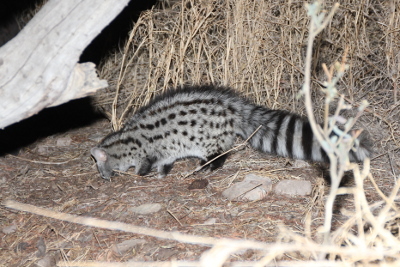 One evening we saw this animal near our campsite - I think that it's a small-spotted genet. 6. Caprivi. Bwabwata National Park, Mundumo National Park and Camp Chobe.